They say a picture is worth a thousand words; I say a first-person narrative explaining exactly what compelled a consumer to click "buy" is worth a thousand articles quoting statistics and trends. These three ecommerce brands convinced me to part with my (hard-earned) cash, which isn't easy to do. Like most Millennials, especially those of us who happen to be compulsive shoppers, the column of Things I Want far outweighs the column of Things I Bought. 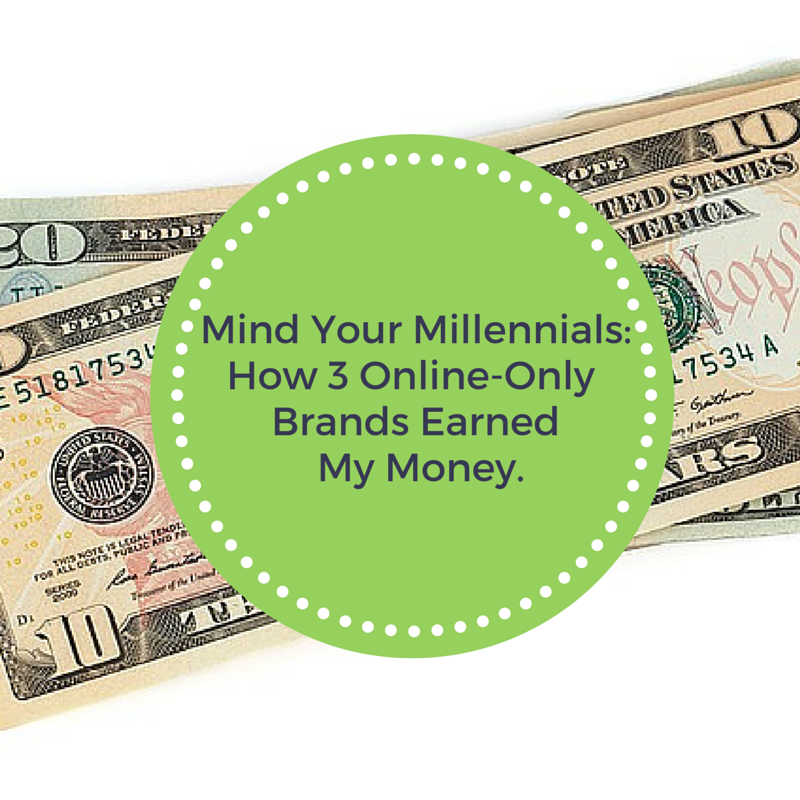 Read on to learn how these three brands earned my money - and my trust. How do I love thee? Let me count the ways. Reformation has become my favorite online shopping destination. They design and manufacture apparel in their LA warehouse sustainably using eco-friendly fabrics like deadstock material that would otherwise be thrown away and materials like Tencel, a "freak of nature" made from biodegradable, renewable, sustainably harvested wood pulp. Reformation's apparel possesses that little extra je ne sais quoi. The designs are somehow modern, classic and retro all at the same time, and a constant influx of new items keeps me coming back week after week. The Sabel Coat and The Hazel Dress. Reformation excels at providing extensive information for each and every product. The unique descriptions are worlds away from the standard one-sentence explanation of most websites. 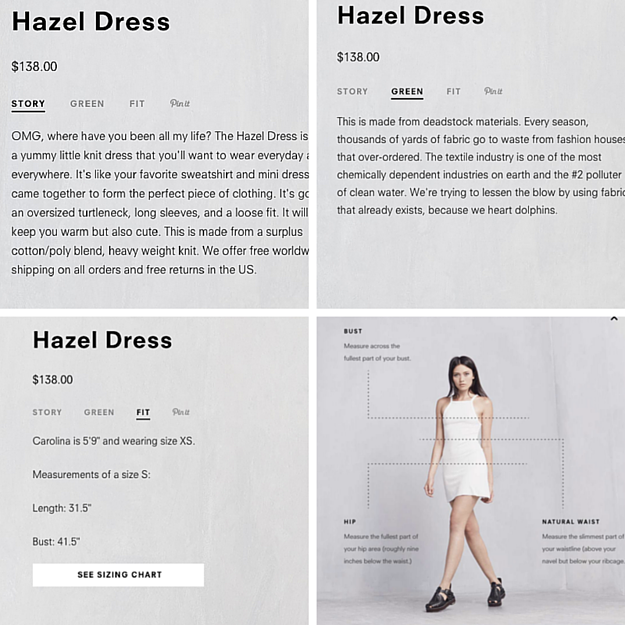 Reformation provides shoppers with a detailed paragraph that reads like a rave review you'd get from your best friend. Helpful sizing information (including the model's stats and what size she's wearing) and multiple high-quality images (from varying angles) for each product in every color are also important factors. My biggest pet peeve is when online retailers only include images of an item in one color, along with a color swatch of the other available options. No, I don't feel comfortable spending money on something when I can't even see what it looks like in the color I want! 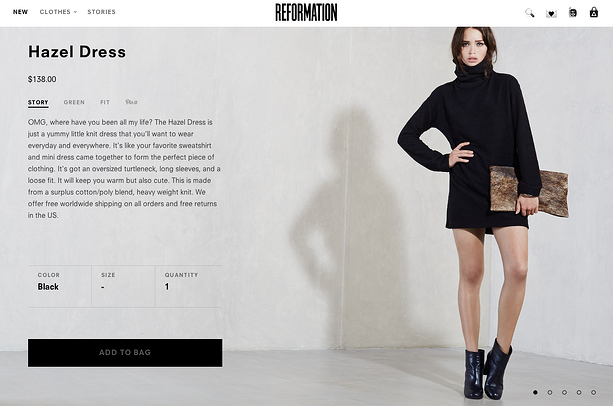 Due to the focus on sustainability, it's not surprising that Reformation provides a full paragraph of information on what exactly makes each item "green". I am surprised by how gosh-darn good it feels to support an apparel company that is eco-friendly and made in the USA. Last, but not least, the reason I've ordered multiple items from Reformation and plan to order many more: their products actually surpassed my high expectations - both items are even better than I expected! All I can say is, thank you Reformation, thank you so much. This fairly new Kate-Hudson-Backed activewear company submits to the monthly subscription model that involves a curated selection of activewear sent to your inbox each month. Don't feel like spending that month? No problem, just select to skip within the first five days of the month; no purchase required. To be honest, I rarely sign up for monthly subscription services and I actively avoid brands that have a celebrity spokesperson. So why did I sign up with Fabletics? I've been on the lookout for high-quality athletic apparel that offers the same features and benefits as Lululemon, without the high price tag. Fabletics' apparel has all of the features and benefits I was searching for: moisture wicking, 4 way stretch, chafe-resistant. They provide detailed fit information and thousands of positive product reviews. They also offered me a killer "first purchase discount" that allowed me to buy both top and bottoms for only $19.99. I would never buy anything simply because it was low-priced. I believe that when it comes to apparel, especially activewear, you get what you pay for (to a point- I cannot justify spending $99 on leggings when there are so many shoes I've yet to buy). That said, when companies offer a sizable discount on their opening order, to me it signifies that they are confident in the quality of their product because they're making the majority of their money on reorders. 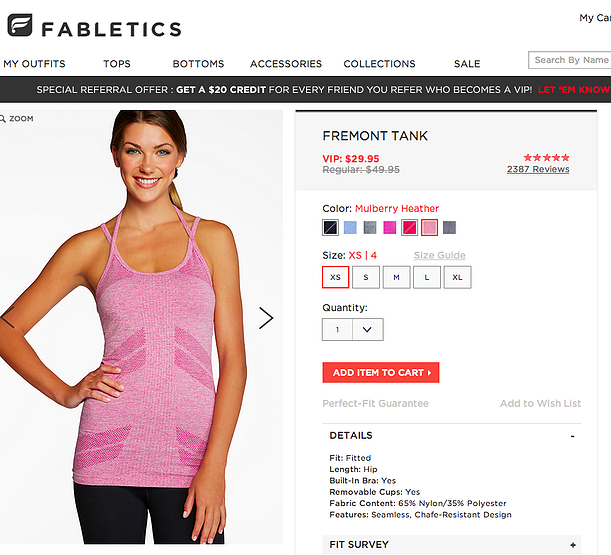 Ultimately, I care most about a product's quality, and I'm very happy with both of the items I ordered from Fabletics. The leggings are ultra-soft and the shirt is flattering without sacrificing function. I wore both items to my yoga class and I was able to focus completely on my practice, the true mark of high-quality gear. Is there anything more sensible than a beauty blog launching a line of beauty products? 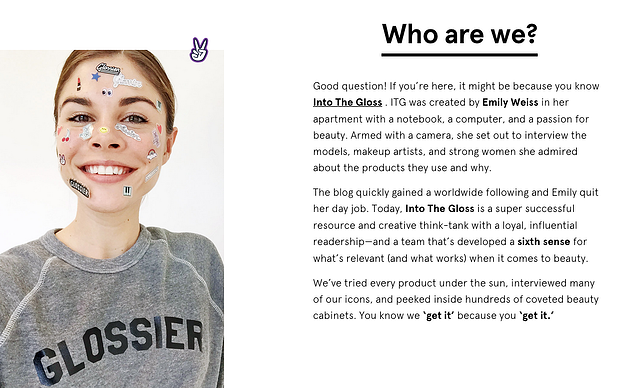 Into the Gloss launched Glossier with the slogan Skin First, Makeup Second which is delightfully logical. Their "Phase 1 Set" is a four piece collection created to create a "perfectly primed canvas" and includes a mist, moisturizer, balm, and tint. So how did an online skincare brand convince me to spend my hard earned dollars without so much as a free sample? First of all, Glossier includes a full list of every ingredient for each product and they call out specific key ingredients with an accompanying explanation so I know exactly what's in each product and why it works. 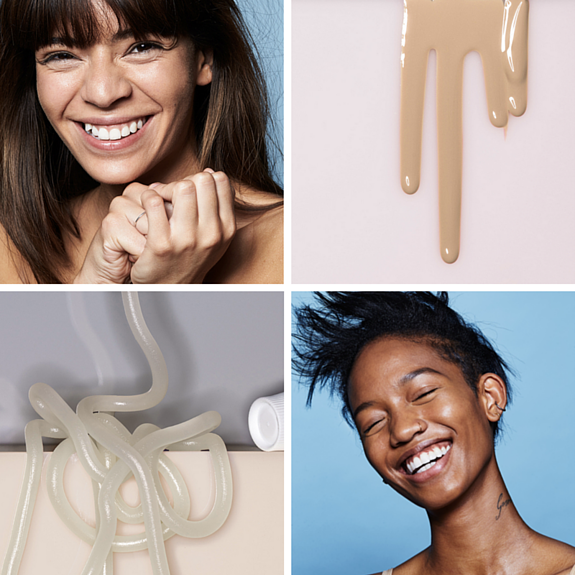 I was also impressed with Glossier's images; rather than the standard flat product shot found on most personal care sites, Glossier's pages are bursting with images: there are pictures of the actual product (not just the packaging) so I can see the texture and consistency, pictures (and GIFs) of happy people with gleaming skin that looks like *gasp* their actual skin, not like skin that's been sprayed with a thick layer of makeup and then airbrushed to within an inch of it's life. I love the fact that Glossier includes multiple testimonials for every product with an accompanying picture of the person giving the testimonial; after all, would you trust a testimonial for skin care products without seeing the skin of the person endorsing the product? 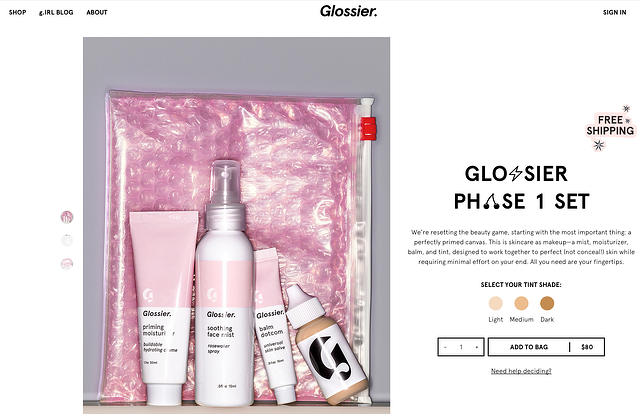 Last but not least, I love Glossier's brand story: I connect strongly with the idea that skin care comes first, makeup comes second and it makes sense to buy products that were developed together in order to work cohesively. I also appreciate the fact that they began with a tightly curated selection of products (4 in total) because it means I don't have to dither around trying to decide what to buy. Finally, I love the fact that, while their message has substance, the brand doesn't take itself too seriously because ultimately buying these sorts of products should be fun, not clinical. I get 100's of emails from different brands in my e-mail inbox every day and I have to be highly selective about what I purchase or I'd be in the poorhouse. These three brands are all different, but they have a few important things in common. They all provided me with lots of detailed product information (including beautiful images and reviews or testimonials) that made me feel confident enough to purchase from them, sight unseen. Each company has a strong brand story or value proposition that is unique in their industry. Finally, each of these three brands has cultivated a good reputation because they sell high-quality products that live up to (or exceed) customer expectations.